We are pleased to announce the release of v1.31 of SDRuno. 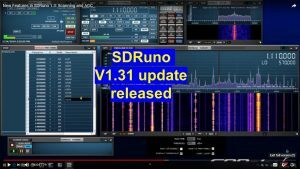 Many thanks to everyone who gave feedback on SDRuno V1.3 which was released last month. Your inputs helped shape this interim update which was released today. Release V1.31 contains a number of bug fixes, functional enhancements and other changes. Since the release of v1.3 of SDRuno, we are aware of a number of users who have had problems with the service API crashing. The root cause of these problems is quite complex, but is PC hardware dependent. We have updated the method by which the service API communicates with various applications and we believe that this will substantially alleviate, if not completely cure the problems that some people have been experiencing. As well as bug fixes, we have made some functional enhancements. Most notably, we have added some new features to the Frequency scanner and made it a simply 1 click operation to switch between Zero IF and Low IF mode and vice-versa.